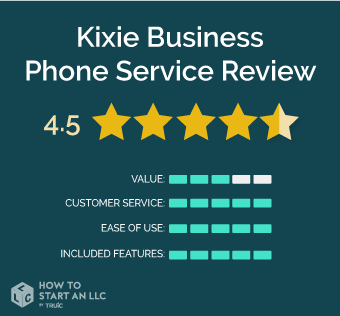 We compared Kixie to other business phone services to give an honest review. Phone services such as Kixie are Voice Over IP systems, which means they are a digital service that can be used across many devices, including desk phones, desktop applications, and mobile devices, instead of a traditional phone service. Kixie offers a high quality phone service available on all devices such as mobile and desktop devices with apps, and desk phone, and is paid for on a per-user basis. Out of competitors such as RingCentral and Nextiva, Kixie is a good alternative due to their approach to Customer Relationship Management (CRM) sales systems, offering a unique integration with many of the biggest companies to record sales calls for analysis and review. However, because basic features such as the ability to use desk phones and mobile apps only come in their most expensive package, Kixie is not the most cost effective option, unless your team prefers web dialing. Who is Kixie right for? Kixie is a tool best suited for an entrepreneur or small team that is very sales-oriented, as Kixie’s primary focus is on integrations with CRM (Customer Relationship Management) systems to log activities. That being said, Kixie offers fully automated calling rules and can make the transition to larger teams too. In an industry full of mediocre customer service, Kixie stands out with very good reviews and support. Kixie allows you to take your phone number with you if choose a different service, which is not allowed at all on some services, such as eVoice. Kixie offers simple to set up integrations with CRM systems like Salesforce, Insightly, Nutshell, Pipedrive and more to log phone calls, as well as team communication tools such as Slack, an extremely powerful chat application. Their pricing is extremely transparent, and does not attempt to lock you into an annual contract. Their cost per minute is one of the cheapest in the industry at 1.6 cents for US phone calls. For comparison, their competitor eVoice charges 3.9 cents per minute for US phone calls. While Kixie’s pricing is transparent, their plans do not include prepaid minutes, however, unlimited minutes for calls to US and Canada can be added for $30/month/user. Kixie only offers a 7-day free trial, which means you will need to have a plan in mind to test the phone system within this short window. While email support is available at all tiers of Kixie’s service, phone support is only available for the most expensive Enterprise plan. Kixie offers multiple pricing tiers, from Basic, an entry-level plan for teams who just need a way to make calls via a laptop to Enterprise, a plan that allows for tools such as Kixie’s mobile app, desk phones, and more advanced features that are geared for sales teams looking for seamless integrations with Customer Relationship Management (CRM) tools. Take a look below for the calling features that come with Kixie, and how each package adds more advanced features such as Kixie’s CRM integrations, recording, reporting, and professional services. Note that the prices shown in the following screenshot are for plans without unlimited minutes, which can be added for $30/user/month. $15/user/month + $30/month/user for unlimited calling in the US and Canada. Otherwise, rates are charged per minute based on their pricing structure. If all you need is a phone number, and the ability to make phone calls online, then Kixie Basic is the best plan for you or your team. With some simple tools such as voicemail, and the web dialer, this is best for entrepreneurs working from a laptop with just a headset. $35/user/month + $30/month/user for unlimited calling in the US and Canada. Who should purchase the Integrated plan? If you’re looking to step up your phone game from the Basic plan, enabling features such as Kixie’s powerful Customer Relationship Management (CRM integrations), and tools to record and report on calling, then the Integrated packages is your best choice. In this plan, you will start seeing the sales benefits of Kixie. $65/user/month + $30/month/user for unlimited calling in the US and Canada. If you’re looking to take full advantage of Kixie’s more sales-oriented system, for use on systems like desk phones, mobile apps, text messaging, full access to an account manager and Kixie’s support team, then Enterprise is your plan. While Kixie’s features are great for teams looking for the ability to integrate with CRM systems, the lowest tier available is the one of the most simple feature offerings available on a plan, as it offers only a web dialer that has to be accessed through a browser. However, the features for CRM integration, mobile apps, and desk phones make up for this in more expensive plans. In an industry such as phone service, top notch customer service can really set a company apart. All of the reviews of Kixie that we examined rave about experiences with their team. With Kixie’s clean interface, good support and knowledge base, setup will be easy and you’ll feel supported the full way through. Kixie has features for all kinds of users, from very simple web dialing to a full integration with many popular CRM systems for easy recording and logging of calls.